After returning from his previous adventure, young Howard Lovecraft must lead an expedition— including his father, Winfield; Uncle Randolph; and Miskatonic University’s Dr. Henry Armitage— to Antarctica, to prevent the awakening of Cthulhu! After returning from his previous adventure to the Undersea Kingdom, young Howard Lovecraft must lead an expedition — including his father, Winfield; Uncle Randolph; and Miskatonic University’s Dr. Henry Armitage — to Antarctica, to prevent the awakening of Cthulhu! 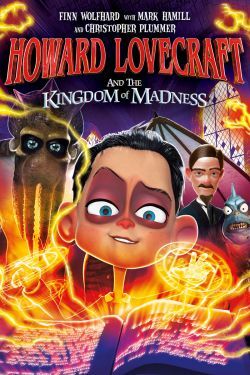 Based on the graphic novel series by Bruce Brown and Dwight L. MacPherson, Howard Lovecraft And The Kingdom Of Madness comes to life with a phenomenal voice cast including Academy Award-winner Christopher Plummer (Up), Mark Hamill (the Star Wars franchise), Jeffrey Combs (Re-Animator), and Finn Wolfhard (Stranger Things)!